We have had unseasonably nice weather and it has caused me to look for fresher and lighter items to add to the menu instead of relying on my normal heavy, comforting winter meals. This carrot salad was one of those items. When I first saw it. I knew I just needed to try it. I’m honestly not sure why because I knew no one else in my house would be interested. 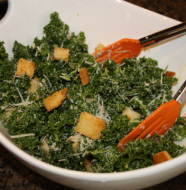 So on an evening we were enjoying soup and sandwiches I decided to give the salad a try. I actually halved the recipe since I thought I would be the only one partaking of it but Jeffrey surprised me and actually enjoyed it. (Jeffrey is not a raw carrot fan so this was a huge surprise.) 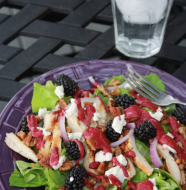 Overall, the salad was a hit and I can’t wait to have it again. I am sure it will be a frequent rotation this spring and summer or anytime the weather cooperates. Whisk together the olive oil, lemon juice, garlic, coriander, cinnamon, paprika, jalepeno, and salt. Toss the dressing with grated carrots and cilantro. 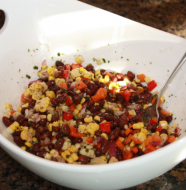 *This salad can be made one day in advance but add the cilantro just before serving. Slightly adapted from Simple Bites. 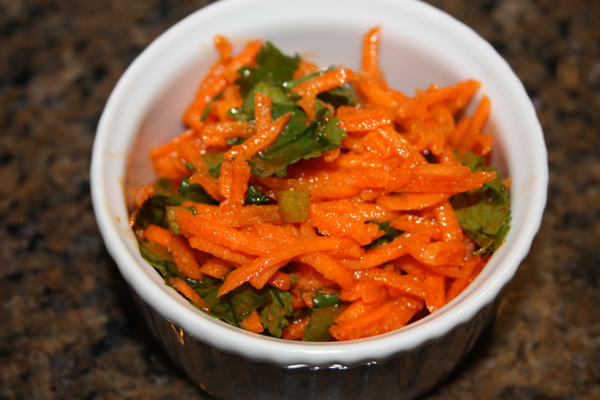 One Comment on "Carrot Salad with Cilantro"
I just shared this recipe with my cleansers. We are on our fruit and veggie week so this was perfect ! !